I used to make pesto with pine nuts. Pesto is a traditional Italian sauce or spread usually made of basil, pine nuts, cheese, garlic and olive oil. I love pine nuts, but the main problem with them is that they’re quite expensive. Then I found myself living in Texas, with six pecan trees in my yard. So I started making pesto with those pecans, and people loved it. Many cards and letters have come in requesting my pesto recipe, so here it is. I recommend growing your own basil if you can, as we can so easily here in south Texas, especially in the fall, past the heat of the summer, through about Thanksgiving, when the first freeze hits. 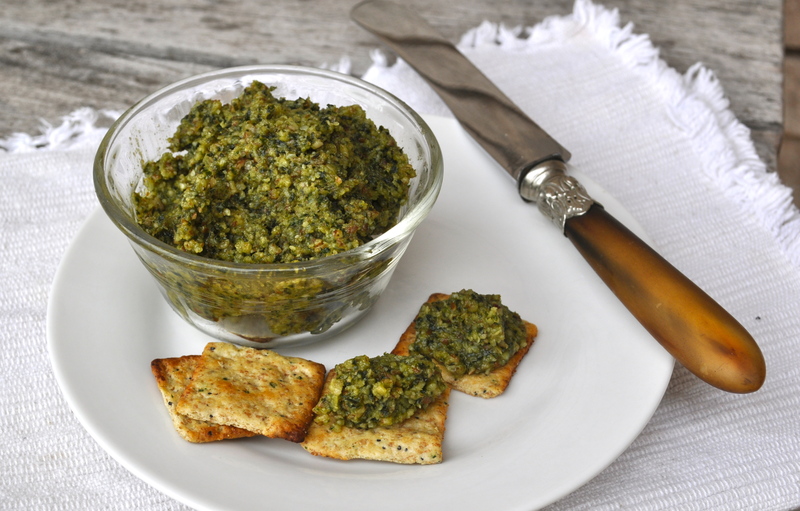 Pesto is great served with crackers. Just put out a pretty little bowl of pesto and another bowl with crackers, and it’s ready. It’s also yummy added to pasta, fish or any recipe calling for pesto. I freeze half batches, which are perfect to pull out for an appetizer with the taste of summer, anytime through the winter and spring. It thaws in little time. Combine basil, garlic and pecans in a blender or food processor. With motor running slowly, add oil gradually. Shut off motor, add the cheeses, salt and pepper, and process again briefly. The Better Breakfast: Cornflakes or Cardboard? Fat Phobia: Why are we so fat if we don’t eat fat? Why Milk in France is a Completely Different Animal from Milk in the U.S. Thanks, Lorrie! Thanks for reading! Thanks for a great idea Anna!